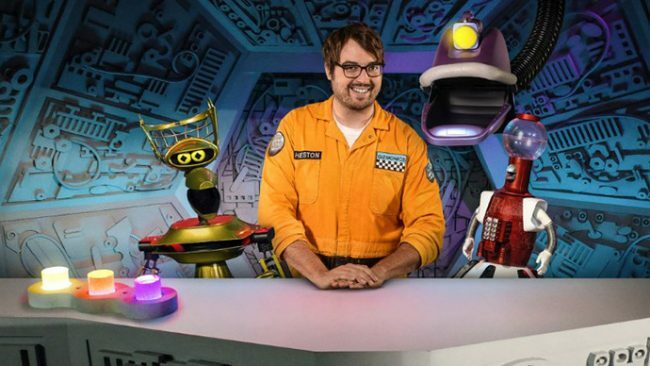 After a week like this, we all need a good laugh, and right now the best laughter to be found is with Jonah and the Bots in the Mystery Science Theater 3000 revival on Netflix. I discovered MST3K during its run on what is now known as SyFy, while my husband’s been a fan since the show’s Comedy Central days, so we were both psyched when we heard the show was coming back on Netflix. We’ve watched about half of the new episodes and we’ve loved every single one (although Cry Wilderness is so far the best of the series). We’re also loving Felicia Day and Patton Oswalt as the new Mads, Kinga Forester and Max, aka TV’s Son of TV’s Frank. Go check the news series out if you haven’t already, and if you need a classic MST3K fix, you can watch shorts and full episodes on the MST3K website and on the official YouTube channel. We’ve been on a board game binge lately, so we thought we’d share this random discovery with our followers who also enjoy a good board game. 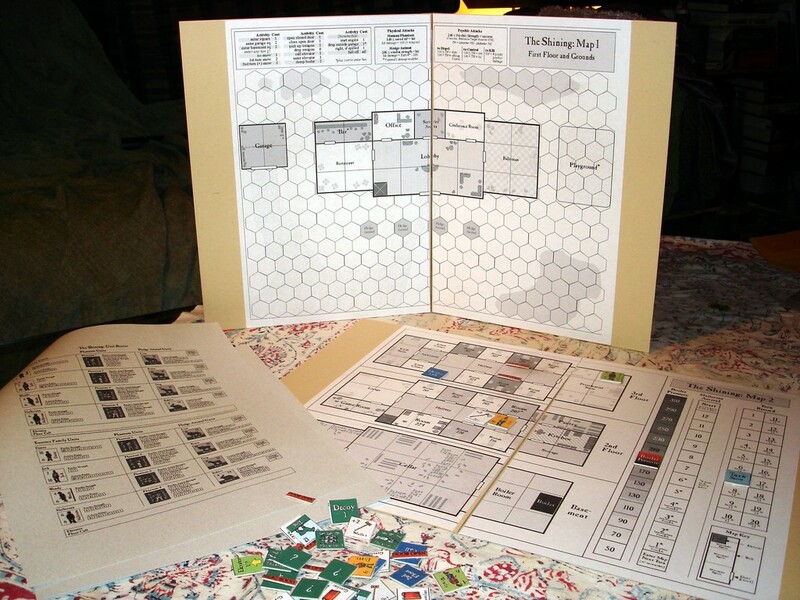 Back in 1998, Stephen King helped design an actual board game based on his novel The Shining, and you can actually download the files, print out the board and pieces, and play it yourself! We’re going to do the same one of these days, but if you get a chance to try it out before we do, let us know how you liked it! Fun Friday: A Bat, Man! March is supposed to go out like a lamb, but this video of a bat eating watermelon has been making me laugh all month, so I’m going to let the bat lead us into April. Have a great weekend! Happy St. Patrick’s Day! In honor of this festive day, I present to you the best rendition ever of the classic song “O Danny Boy” to ever grace the world. For our first Fun Friday of the year, we’d like to share a card game we received as part of our Christmas gift haul. 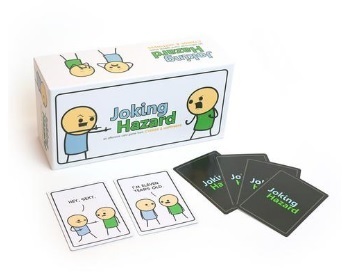 The game is Joking Hazard, from the creators of Cyanide and Happiness. The concept is very simple: each round, a judge plays the first two panels of a comic strip, and the other players have to play the punchline panel. The funniest punchline wins the round. That’s it! Fair warning, this is a game in the same vein as Cards Against Humanity in that it is not for the timid or easily offended. It is raunchy, gory, and tasteless, but if you’re okay with that kind of stuff, it’s also hysterical (especially after an adult beverage or two). On Tuesday we unveiled our new Frankenstein-inspired design, which we’ve made available not only as an embroidered bookmark but on assorted merchandise through our Redbubble shop. When it comes to offering items through Redbubble, I often have to experiment with placement so the design works well on whatever item it’ll appear on. Sometimes, no matter how much I tweak and fiddle, a design simply does not work on certain items, so I make the decision to simply not offer a specific piece of merchandise. 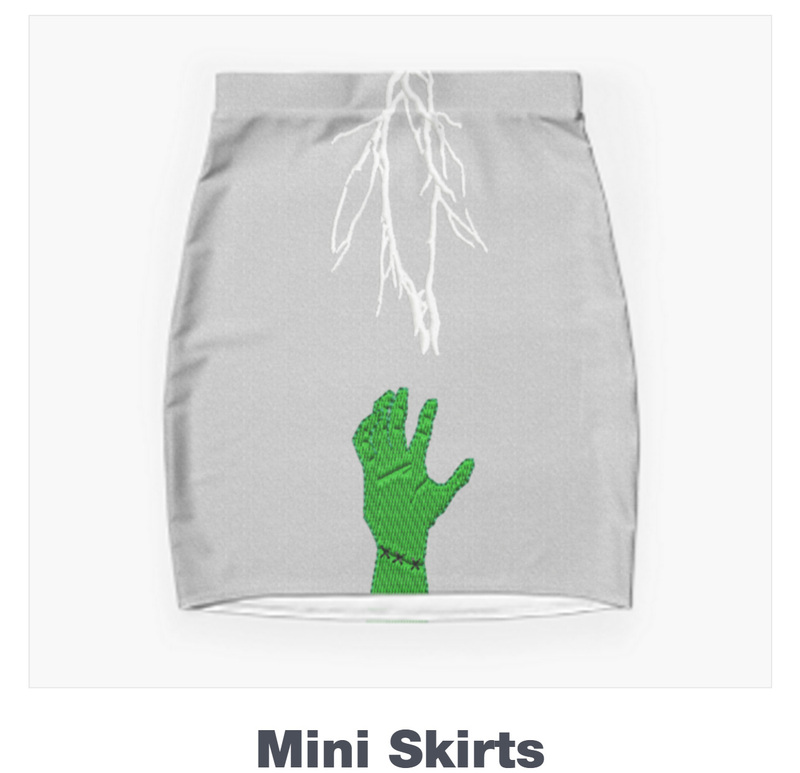 I made that decision this week when I realized that the Frankenstein design, when placed on a skirt, was a little too suggestive for its own good. The placement of the hand and the lightning made the piece unintentionally humorous, so I thought it better to take a pass on skirts — but far be it from me to turn up a chance to share a juvenile laugh with everyone, so for your amusement, here’s what the skirt looked like. Enjoy, and we hope everyone has a great Christmas weekend! In the spirit of the season, today’s silliness comes courtesy of Emmet Otter’s Jug-Band Christmas — specifically from the Jim Henson special’s blooper reel. Enjoy!